Thread: Anyone know this block/pattern? HI there, I saw this picture on Pinterest, but there was no info posted about the name of the block or designer etc. Does anyone know what this block or pattern is called? I really like it and it would be perfect for my scraps LOL. It looks to me like it might be some sort of Kaliedescope variation. Really hard to tell by that picture though. I agree with Feline Fanatic. Looks like Kaleidoscope using English paper-pieced. 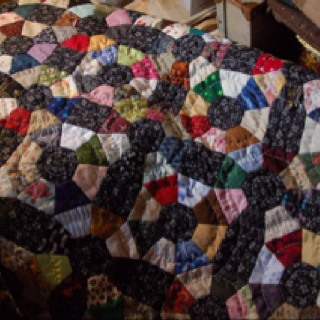 I didn't find a pattern, but I found a quilt called "Octagon Scrappy". It's a little less than half way down the page. I agree with the others - sure looks a kaleidoscope variation. That looks like what it is exactly, thank you! The pieces look like they might be the tumbler shape? placed around an octagon center.